Diamonds are not only a girl's best friend... they're her best bet when figuring out what to buy her mom for Mother's Day! Don't fret, though, all you guys out there! 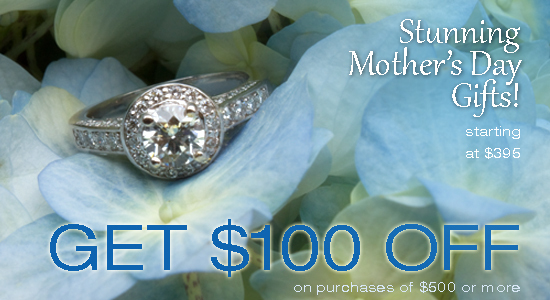 Diamonds don't have to be your best friend for them to make the perfect gift for your mom, wife, or grandmother. At Inter-Continental Jewelers, we want to make your diamond purchase as fun and easy as possible. Our knowledge staff is here to help you select the right diamond jewelry for whatever occasion you have coming up. We know that diamonds aren't just for engagement rings or wedding bands…they can be for a heart pendant like the one at the top on the right. A sweet, sparkling 14K white gold diamond heart pendant like that would make any mother's heart skip a beat when she opens it. And since we sell wholesale, the price is amazing at 70% off the retail price. If you want to go with something a bit more impressive, why not opt for this 14K white gold diamond tennis bracelet? With 2 ctw of diamonds and 53% off the retail price, the numbers are in your favor that she'll love it and so will your budget. A bracelet like this (pictured center right) can easily be paired with her favorite jeans and blouse for a casual but classy look but would go effortlessly with a bright summer cocktail dress. Every woman loves diamonds and versatility…this bracelet gives you both in one fell swoop! Another option is to go for earrings that have a floral theme, like those shown at the bottom on the right. In 14K white gold, these diamond dazzlers will remind her and everyone who sees them of the glory of spring and warm, beautiful days. They'll add a shine to her complexion and a make her feel as beautiful as you know she looks. After all, isn't Mother's Day all about celebrating what an amazing and wonderful woman your mom, grandmother or wife is? And how better to do that than by giving her a beautiful pair of floral diamond earrings? No matter what you choose, diamonds are always a great gift. They'll last for lifetimes and she can hand them down to her children or grandchildren, along with the touching story of the time you gave them to her and how special she felt. Inter-Continental Jewelers is here to help make those memories happen.